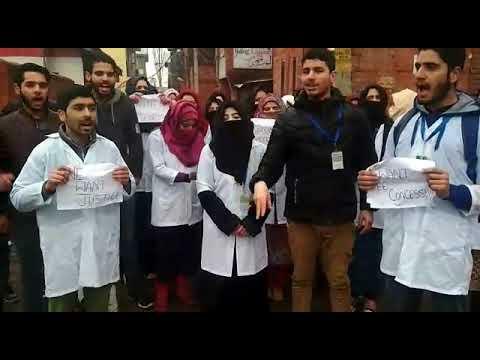 Srinagar Feb 6: Students of Bsc Nursing of South campus Kashmir University on Wednesday staged a protest to demand fee concession. The students raised slogans in favour of justice and demanded immediate fee concession by the authorities. The protesting students said that the other nursing colleges offer maximum Rs 38000 per year for the course but the KU is compelling the students to deposit Rs 78800 per annum. They said that several colleges are offering different and less amount for annum in the course that include Bibi Halima nursing college Srinagar Rs 50000 per annum, Govt Women's College of nursing Rs 38000 per annum, SKIMS medical college Rs 10000 per annum and GMC Srinagar Rs 8000 per annum while as KU authorities are minting the money from poor students. Terming it as an injustice with them, the students appealed higher ups to look into the matter.